We were all hungry upon our arrival at Chiang Mai around 2.30 pm (Malaysian Time). While we were on our way to Royal Flora Ratchaphruek, we stopped by a simple lunch. A quick snap. 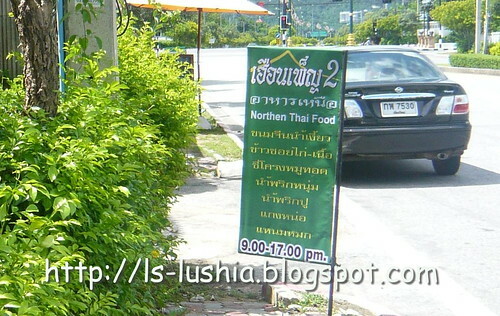 I can't read Thai- We stopped here for lunch! Thai Curry Noodles served with preserved vegetable and onions and chicken drumstick. Thick curry gravy and tender chicken. Good but a lil' small in portion or probably I am big eater?